Before we get started, it is prudent to discuss the choice between LED (light emitting diode) bulbs and LED engineered fixtures. Many boat owners choose to ease their way into LED lighting by putting a few LED bulbs into their highest use fixtures. This is mainly to reduce power consumption when out on a mooring or at anchor, especially for those without generators or for locations where generator use is restricted. LED bulbs are less expensive than LED engineered fixtures, and usually require little to no modification to the fixture. The compromises are generally in light output, light distribution, optical aesthetics (e.g. “dots”), color consistency, dimming, and long term performance. LED bulbs can be a great choice for those on a budget and or for those who use their boats on a limited basis. If you live aboard or spend a lot of time on your boat and want more functionality (i.e. dimming, multiple colors), more light output, better (white) color consistency (from light to light), an engineered LED fixture is the smarter choice. Engineered LED fixtures are designed around the LED light source delivering optimal efficiency, better light distribution, superior optical aesthetics, and usually with components that offer maximum protection against over-voltage, transient spikes, and RFI (radio frequency interference). Whether it be LED bulbs or LED fixtures, you get to choose from different “color temperatures” usually described by “Kelvin” or “K” for short. Most boaters choose warm-white (i.e. 2700-3300K) for interior general lighting. Its warmer tones provide a more intimate and calming environment. It will make skin tones look healthier and food look more appetizing. Think red meats and pasta sauce… Reading lights used as ambient lighting should also be warm white. But if used primarily for reading, a neutral or cool white light may be considered, as it relieves eyestrain and fatigue. For exterior illumination, cool-white will make white gel-coat surfaces sparkle and look brilliant. A recent trend is to use blue (or even green). The blue wavelength carries a long way; just a few very low wattage blue courtesy lights can really light up a cockpit or the aft stairs/swim platform area; you will never have trouble finding your boat out in a crowded mooring field…unless of course everyone else also has blue lights! If you have decided to invest in LED engineered fixtures but are not sure where to start, try looking at those lights that you use often but that wouldn’t require a whole lot of periphery work to replace. For example, consider your reading lights and chart lights as a first step. There are many LED reading lights (and chart lights) on the market with mounting bases available in several sizes/shapes. It is likely you will be able to find something that will replace what you have while only requiring drilling an extra hole or two for the new mounting screw locations. Also, most reading lights are not dimmed and therefore the LED fixture’s lead wires can simply splice in to your existing boat wiring without having to chase additional control cables, etc. Many LED chart lights are offered with bi-color red & white LEDs and/or with an integrated dimmer controlled by a built-in push button, photo-sensor, or touch sensor. These features still would not require any special wiring. Almost as easy to address as reading/chart lights would be courtesy lighting, and there is no shortage of choices on the market. Replacing or adding courtesy lights is easy to do and can make an immediate improvement to your cockpit and/or swim platform area. Most LED courtesy lights are available in different color choices and some are switchable between two or more colors. The surface-mounted models are a very simple retrofit project. Just find one large enough to cover existing screw holes and/or marked up surface where previous lights were installed. 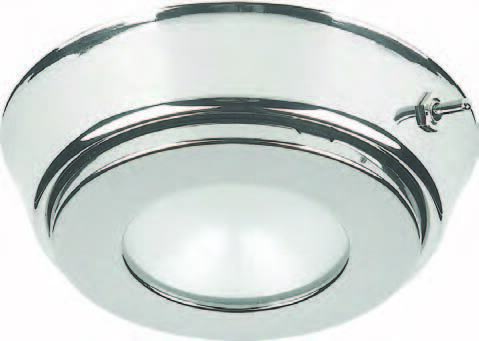 There are also many flush mount (recessed) models on the market and with little or no modifications to the existing holes, you’re likely to find something in LED that can replace what was there without much retrofit work. Another area that can be spruced up quite easily using LED is indirect lighting in the form of either LED rope light or LED tape light. Most of the LED tape light on the market is provided with very effective 3M double-side tape and can be cut down by the installer to fit just about anywhere, including under cabinets, alcoves, bookcases, or behind valences. The only downfall to this type of product is that most are commodity-type products not specifically designed for marine DC systems and in many cases lacking the built-in electrical protections (over-voltage, transient) found in purpose-built marine LED fixtures. So, it would be wise to also wire in a voltage stabilizer or voltage conditioner with these products in order to take advantage of the LED’s inherent long life. Moving to utility areas of your vessel, LED’s bright light and low power consumption are truly appreciated in areas such as engine rooms, bilges, lockers and holds. 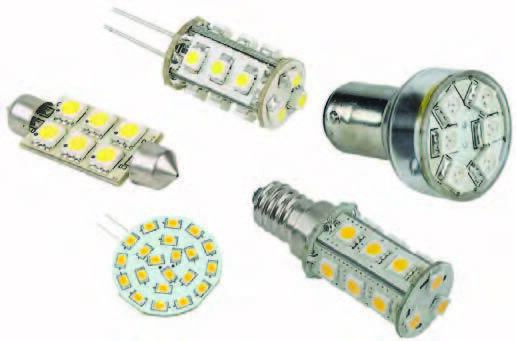 LEDs are now rivaling the light output of fluorescent lamps commonly used in these areas. But unlike fluorescent, LED fixtures and/or LED fluorescent replacement bulbs contain no mercury or toxic phosphors, don’t have delicate filaments or glass tubes, will not flicker or make audible noise, and will start up at full brightness, even when it’s cold! General overhead lighting can get slightly more complex. Much depends on the existing fixture and the mounting surface. Like bulkhead-mounted reading lights, the surface-mounted fixtures are generally the easiest to retrofit if you can find a replacement fixture of the same size (or larger) to cover existing screw holes and ceiling blemishes. With recessed fixtures, you must consider the existing hole cut-out, how it is fixed (via springs or screws) and whether there is adequate recess height. LED “finned” heat sinks often require a little more depth than traditional incandescent/halogen fixtures and there should also be adequate airflow above and around them for proper thermal convection to keep the LEDs and electronics cool. LEDs don’t radiate heat through the front of the fixture, but they do generate heat (like any electronics) and require a certain level of thermal management to guarantee a long life. The other consideration is whether or not dimming will be required. 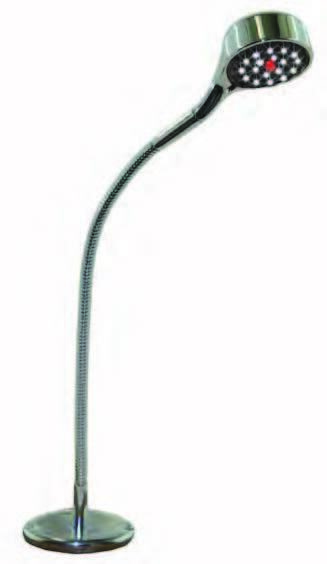 Most dimmable LED fixtures require a third (or fourth)* wire that must be run to a dimmer module (usually hidden behind ceiling, wall, or perhaps located centrally near the electrical panel). *Note: there are also some new 2-wire dimmable products on the market that work well, and some of these may even work with your existing halogen dimmer! But there can be compromises in dimming performance and there is a slight risk of RFI with some of these products, so do your homework. 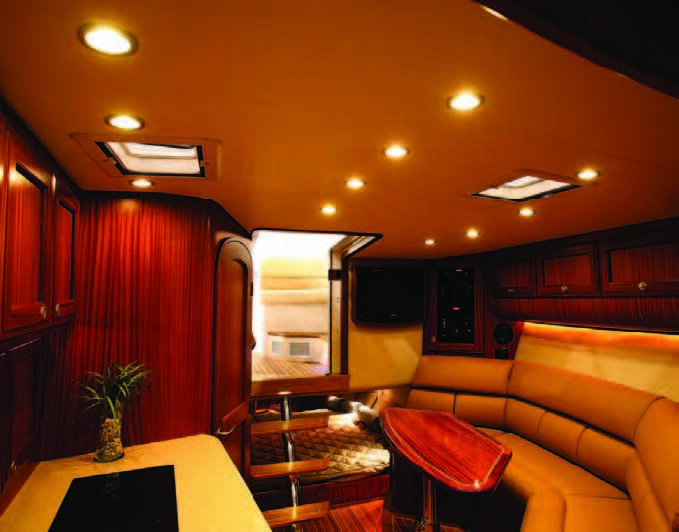 Other areas of your boat that are ideal for LED upgrades are relegated to the exterior of the vessel. This includes above-deck lighting such as hard tops, radar posts, floodlights and navigation lights, as well as below the waterline where there are many choices of underwater lights available. For many of the reasons that have already been discussed – low power consumption, superior light quality, choice of colors, and long-term reliability – it really makes sense to make the switch (to LED) for every part of your vessel. Kinder Woodcock is the Lighting Product Development Manager for Imtra Corporation in New Bedford, MA. Kinder has several years experience with marine electrical and mechanical systems and an extensive background in marine lighting and LED technology. An avid sailor, he enjoys cruising with his family on their Ericson 35 in the waters of Buzzards Bay, Cape Cod, and the coast of Rhode Island. Visit imtra.com for more information.